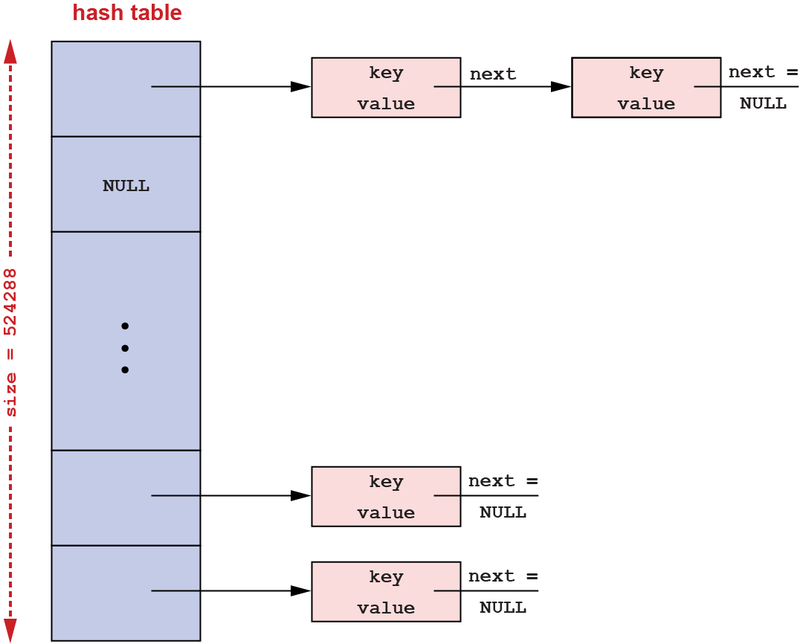 Understand the importance of dynamically resizing a hash table. Practice the implementation and usage of circular doubly-linked lists. Make use of the hash table to aid in maintaining word usage counts in the spell checking program. *** missing separator (did you mean TAB instead of 8 spaces?). Stop. then please save this Makefile to your directory on CLEAR to replace the Makefile copy you got from GitHub (do not use copy-and-paste to transfer the contents of this file). There has been a problem with this file on GitHub this week, and this should work around that problem. As described in last week's lab, hash tables are often dynamically resized as as the occupancy of the hash table increases, to reduce the length of the collision chains. Smaller collision chains enable faster lookups and deletions. For example, below we illustrate the impact of resizing hash tables in the spell checking program from last week's lab. 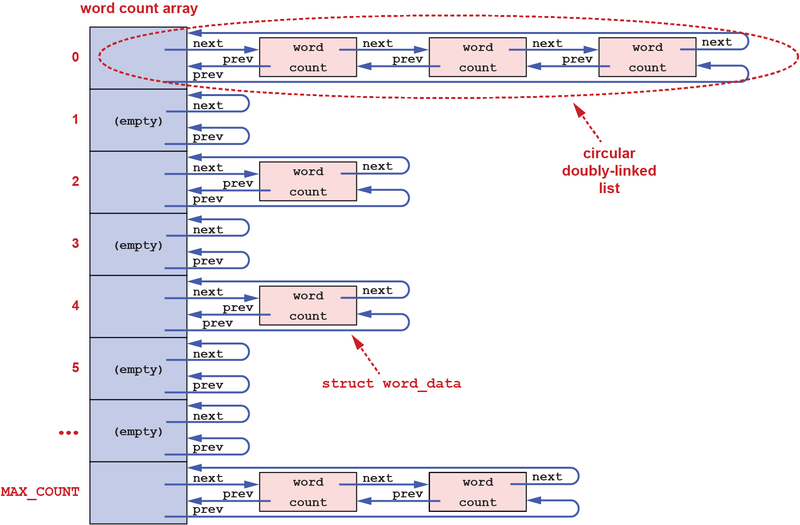 The figures below show the hash table structure after all 479623 words from /usr/share/dict/words have been inserted into the hash table, with and without table resizing. When the hash table is not resized from its initial size of 2, the result is two huge collision chains with 239664 and 239959 elements, respectively. Clearly, traversing these linked lists to perform lookups and deletions is going to be very slow. When hash table resizing is enabled, the hash table's size grows from 2 to 524288, as the words are inserted. After all 479623 words have been inserted into the hash table, the average size of the collision chains is only 1.53. 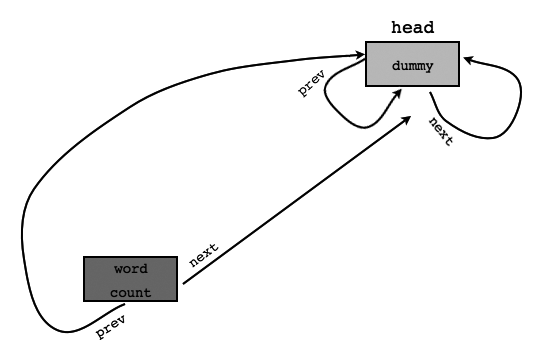 This enables very fast hash table lookups and deletions. The file spell_check_lab5.c in the repository for this lab is a copy of the spell checking program from last week's lab, and the file hash_table.c is a completed implementation of the hash table from that lab. to make the program spell_check_lab5 by compiling and linking these two source files together. in hash_table_resize() to disable hash table resizing by ensuring that the hash_table_resize() operation has no effect. * chains? If so, do nothing. Note that this test will run for a long time. When you get tired of running it, you can terminate it by typing a control-C character. Now remove the lines from hash_table_resize() that you inserted above, to reenable hash table resizing. PLEASE NOTE: The remaining exercises in this lab use spell_check.c not spell_check_lab5.c . Only Exercise #1 uses spell_check_lab5.c. Also be sure you have removed the lines from hash_table.c that you inserted in Exercise #1 above. The goal here is to modify the spell checking program to also maintain the usage count of the words in the dictionary as it spell checks the input documents. Moreover, we want the program to order the dictionary words in this counting by their usage counts and to then print the dictionary words ordered by usage counts after all input documents have been checked. 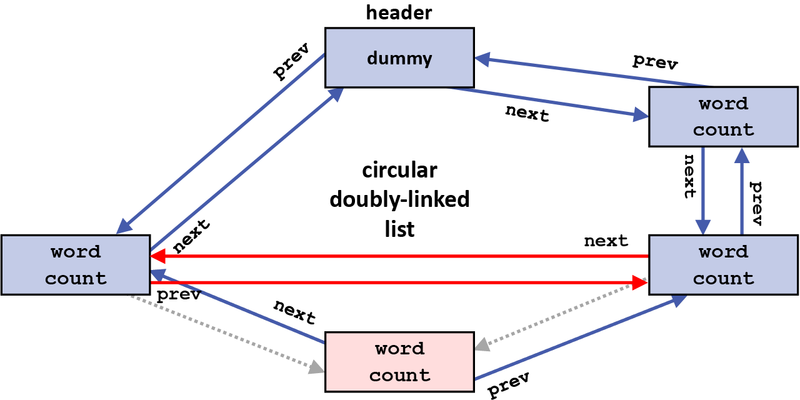 To simplify the task, we will maintain the order only for usage count values of up to MAX_COUNT - 1 (i.e., only for words each used up to that many times). Usage count values greater than or equal to MAX_COUNT will not be ordered and will instead all be treated equally. The implementation of word counting in spell_check.c uses an array of MAX_COUNT + 1 elements. 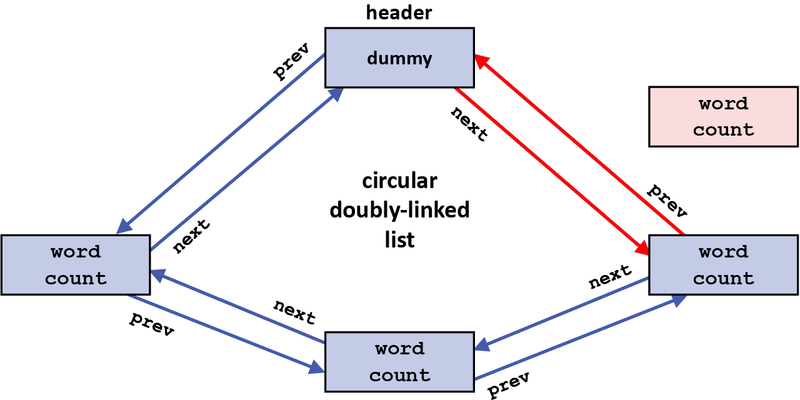 Each element is the dummy head of a circular doubly-linked list. Each list corresponds to a usage count value that is equal to the array index value. 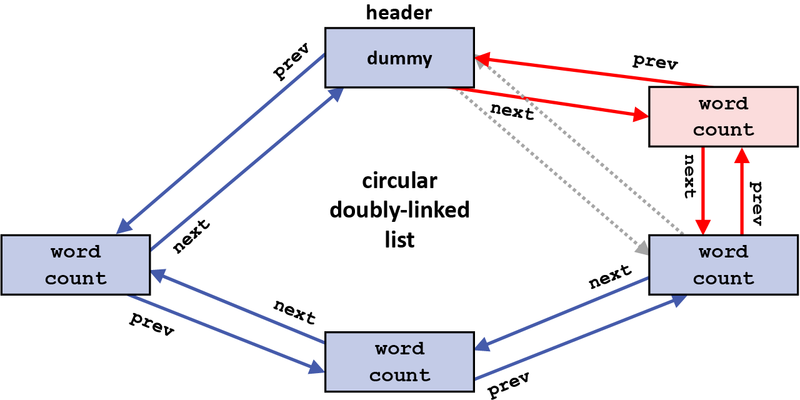 That is, words with a usage count value of x are stored within the circular doubly-linked list whose head is at entry x in the array. 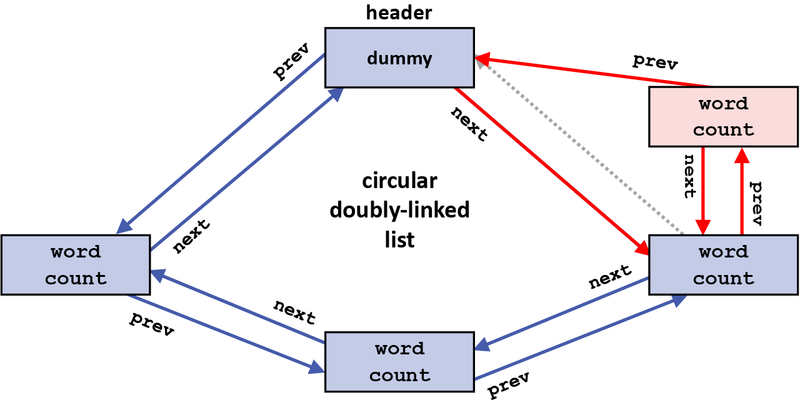 However, words whose usage count is greater than or equal to MAX_COUNT are all stored together in the circular doubly-linked list whose head is at entry MAX_COUNT in the array. The benefit of using circular doubly-linked lists in maintining the usage count data is that when the usage count of a word increases, the word can be removed from the list corresponding to its old usage count in constant time, and can then be inserted (also in constant time) into the list corresponding to the word's new usage count. There are 101 words (46 different words) in test_file.txt; the word that appears most frequently in it ("this") has a usage count of 7. If you do not want words with usage count 0 to be printed, you can change the initialization in the final for loop in main() to use i = 1 instead of i = 0. Note that we have added a new command line option -o <output_file> to spell_check. The purpose of this option is to write each word in the dictionary together with its usage count to the specified output file. This output is implemented by passing the address of the output_word_data() function to hash_table_iterate(), and passing as the cookie the FILE * for the opened, writable output_file. PLEASE NOTE: Again, using hash_table_iterate() will not print the words in sorted order. Check the output file output2.